Last week, from 3rd to 8th of March we were exhibiting our latest products at CeBIT 2009 in Hanover, Germany. 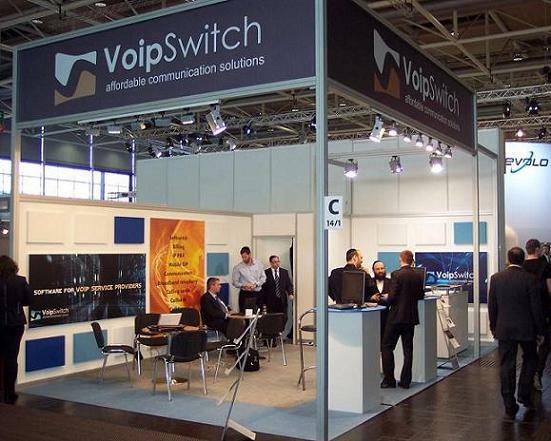 The dynamic range of Voipswitch modules incorporated in the Voipswitch main solution caters for a very broad range of Softswitch VOIP clientele. Interested potential clientele included WIFI, ISP and VOIP operators. VOIP hardware manufacturers from Asia, Europe and the USA exhibiting their wares at the fair showed interest in having the Voipswitch modules incorporated in their hardware. At the end of the article are more pictures from the show. At the Exhibition, demonstrations were given showing the latest window mobile and IP-PBX software in addition to the already versatile standard Voipswitch modules. Voiceserve’s CTO Mr. Chris Oglaza commented, Our past experience at Cebit has shown that this exhibition is a very important platform for launching and presenting new features within the Global Telecom arena. We were very encouraged by Cebit this year. Despite the current economic climate we had well over 250 leads. It is now up to our sales engineers and technicians to follow up the leads and try to convert as many as possible into sales. With the launch of the new modules, Voipswitch current clientele will be notified of the additional features, and invited to have these products incorporated in their softswitch systems.